Fixed some wrong card names. Thanks for reporting. Percival if you are going to use my cards,the constellar and the evilswarm ones, (i know you used my cards because that cards have the same problem that the ones i made and upload to mediafire, the problem is in the border of the names) thanks me.Also use the tcg images that are better than the ocg ones. I will continue changing some cards to the tcg version anyways. where is the update only? Thank you, you deserve a rest. Literally does the work alone and without gaining anything in return. Thanks again and keep well. Percy, is there any way to change the font color of spectator chat? With the background I am using it is almost impossible to see what spectators are saying. Thanks. Ok who should I give credit to? Hey Percy, you have the original .EXE like the last version? I need to fix my low FPS. I changed my D3D to 1 but i need too of this exe. And why I can't comment with firefox anymore? I publish my comment but nothing happens. So Percy, I'm curious; is that "Dawn of a New Era" version a copy of your changes? Or are you both just adding images to Fluorohydride's basic scripting? Because the KC version has a server, and while I find their splash screen and lobby and etc. to be atrociously laggy and awful, you really need a server for people to play on to make this mainstream. I think Percy approves each comment manually, so as to stop spam. Thanks, percival for the update. Also, for Bull Blader, i thought it was a mandatory effect because it doesn't say, "You can", but i keep seeing "YES" and "NO" option appearing. lol, i feel so bad for the new cards 'cause i want to try them but can't seem to fit all of them into my deck. When we'll have Bahamut Shark? How to update 102A to B ? why i still low FPS?. Dont you think that Percy does enough, besides servers are big things that needs money and funding, it's a great idea but seriously you should at least try and find a group of people or whatever to start a server Percy does enough and we don't want him to get fed up of all these requests. how to install update version?? Percival18 i know you will read this so i just wanted to say thank you for being so fast with releasing this version i really appreciate it that you are doing this for us and i can imagine how much time and effort you put in it so that we can play it. Thank you and i just want you to know that i really love it what you are doing. Thanks for the usual good work Percy. Btw, it looks like this version doesn't work with the Chinese server, or is it just me? the mermails monsters are here!! Same cards graphic from 1.02A.0 ... needs to be the 1.029.0 graphic. thanks for the update, but the FH Chinese server says 102b1 is needed to play not 102b0 ?? Thanks Percy for new ver. But I have a prob.Low FPS.I Copyed file in folder root.But Its still low fps. So I used original file exe.FPS isnt low, but I cant join any host by this new exe. Can help me fix bug? i still have low fps? Frankly, I don't even know how someone would go about hosting a big server for people to play this on. You can't do Gameservers or something like that, because that's game specific. Do you just rent out a site? I mean, DN can hold like 5000 or something people. Just how would we manage to hold up a server like that? If you have any ideas, please, let us know. with what programm u edit the card data base? anyone else having a bug when closing the program... my decks aren't being saved as a result. Low fps and fonts with bugs... please fixed. is there a way to know all the newly added cards in this version?? There's an image in textures folder named "field.png", whts tht for? Look at the "New cards since 1.02A.0" part..
hello percy, why i cant host and join a duel in dawn of new era? i have the 1.20b.1 please help me. I made a new 7zip file with your pics and thumbails just like the one you check before but this new one has ALL evilswarm and constellar (the xyz too) corrected the problem with the border of the names. Also has changed the names of geargia accel and geargianto X to geargiaaccelerator and gear giant X. Also i create a shadow of the six samurai - shien and rope of life cards; also i changed the name of all ooparts (xyz too) to chronomaly and some magical to phropecy. After all of that i continue changing the artwork of some ocg cards to tcg ones using the tag force games. I still have low fps on this version. 1.02B.0 works fine, but when I update to 1.02B.1, the exe crashes upon startup. Anyone else having this issue? I'm wondering that too .-. Perci please do a Fix for the .1 new version! it crashes at every end of duel, Also my antivirus dectect it as a Trojan ._. P.S. the game crashes while using Morphing Jar OR\AND Battle Fader! I got the same problem. Fix it Percy, please. btw is heraldic aberconway and falcon exixt in this version??? use the files in the "_alternate _ executable" folder in the game directy and the game wont crash. To be honest I have no idea if all cards are compatible or not. 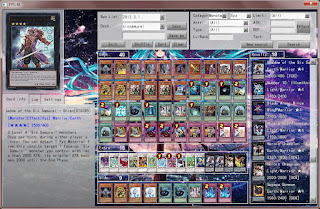 I don't have time to play yugioh anymore, let alone test every card on the chinese server. So if anyone encounters any card errors, please report it. Thanks! First of all, this is Fluorohydride's jurisdiction, not Percy's. Second, none of these cards have been released. Only released cards are put into YGOPro, since they need their Card Number, which is unknown until the card is released. I updated the file now. Please redownload. may it be possible to place riding duel mode in the game? Perci does the alternate exe works with 102.B.1? Percy, I don't know why you crossed out instructions on how to use the FH YGOPro client in your tutorial on how to duel on the chinese server without Hamachi. It still works perfectly fine. I just had to change the server addresses and put in my username and pass in the login.conf file. I've been dueling on the chinese server with 102b.1 for like 2 hours now. Now need Joey's last card Graverobber (I don't think is sure the last Joey's card) and Des Volgstalph. can you use script writer program does do you use in 1.028/1.029 version? can u be more specific wht u mean?? Hi Percy the alternate executable for 1.02B.0 worked perfectly however since you posted an update to upgrade to 1.02b1 everyone on my network is now using it, so I am asking can you please make an alternate executable for the update "1.02b.1" as well for slow FPS. I know that Percy is not the one responsible for add cards, but I don't know how to send this list to Fluorohydride, so there is it.. If someone can send the list to Fluorohydride, I would appreciate. Getting authentication failure from the FH-YGOPro client. Registration says username and email already exist and I know my password is right. So...maybe it isn't quite as reliable. Wish I could just start up a server heh. The alternate exe has been uploaded. Thank you for your patience. ALL GOOD, MAY U MAKE A COMPLETE 102B.1 TOO??? you are doing a great job but u'll put only the officiel cards or u'll put the anime cards too ? And thanks once again for your hard work and determination. Hello Percy, I was looking at some charts and noticed that the monsters "Clear" are not in the game. If you can, add them in the next update. i got a question for a Elemental HERO Divine Neos. Why does it have an alternative name ability when it doesn't say it in its effect? Hmm, before this version, Old Vindictive Magician's effect would work properly. However, since the 1.02b update, it's stopped working. It's a mandatory effect to destroy a monster on the opponent's side of the field. No longer activates. Going to also report this on Fluorohydride's GitHub. i have problem with mermail abyssgunde. when i summon abysspike and use it effect to discard abyssgunde, it doesnt have its effect activated. as i know, it will not miss timing as the card say "if this card is sent to the graveyard" not "when this card is sent to the graveyard". am i wrong? Junk Defender's effect is permanent, but it's ending on the End Phase. Please, fix this. My friend is trying to play but he can't. he gets the error "0x000001d". he uses windows xp 32 bit. can someone help? can u post screenshot of error ur friend has?? That card wasn't released, therefore it wont be added. And please more Photon and Meklord cards! This isn't related to YGOpro. Did you download your Tag Force 6 for PSP? if so, can you give me the link to it? And also, what firmware are you using? Percial thanks a lot for doing this great job. But I was thinking, I could tell that will be invoked when a monster game with a video iniciase form fosseadicionado type appears very quickly when it invokes the image of the monster more instead he executase video video there could be the invocation of the monsto, man that would be very exciting, I'm not asking so I'm wondering if the most would be really cool if it goes. Alternate 1.02B.1 executable. Only use this if you have low framerate! oh no, i think tcg made a mistake with that 'cause in ocg, it's only until the End Phase. they also made that same mistake with No. 7 Lucky Straight. Even after using alternate executable I stiil get low framerate, any idea? Effect veiler is not working! please fix it! I know someone also brought this up, but after I "upgrade" from 1.02B.0 to 1.02B.1; the .exe crashes when it starts. 1.02B.0 worked perfectly fine though. P.S: I also tried die alternate .exe, still crashing. Would be awesome if someone came up with a solution... I don't want to cease dueling until the next update. I can't solve the Duel Puzzle no 8. 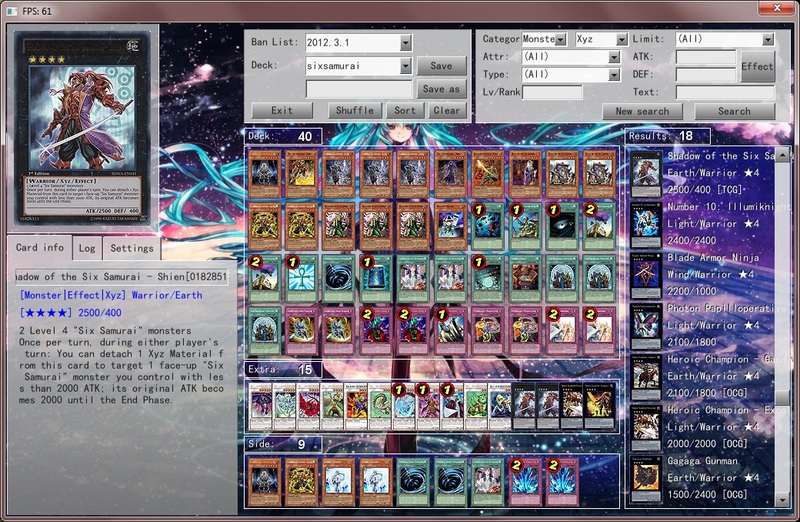 I already add Foolish Burial into the puzzle when i look into the YGO wikia, but still can't solve it. my friend doesn't get the error anymore, but he gets very low framerate (FPS 3,4), and he's using the alternate version D: how to fix it? "Grave of the Super Ancient Organism" didn't work on "Blackwing Armed Wing" (there was nothing influencing its level neither the trap card's effectiveness). I'm wrong Blackwing Kochi the daybreak doesn't a effect monster. So It can't synchro when special summon by Shura. However please add Blackwing Damacus the polar night,Thanks. https://fbcdn-sphotos-d-a.akamaihd.net/hphotos-ak-prn1/s720x720/557942_271846696257285_673687492_n.jpg how to fix it? Heroic Champion Gandiva can activate its effect more than once per turn when it's not supposed to. Many crashes in this update...Most of the time when i close ygopro also, i've low frame and the "alternate executable" doesnt resolve the problem. Anyway, thx for your work. What i actually meant was i've crashes when i end a duel. And my misreading, Rescue Warrior works ^^. Duel Puzzle No. 8? The one with watts? Is not Foolish Burial its a set Foolish Revival. Hey I found bug in this version. monster name " Volcanic Doomfire " 's effect is unable " any opponent's attack position monster will attack its " ,but in game that isn't attack.